According to a 2014 UN Global Study, San Pedro Sula is the world’s most dangerous city with three murders a day, making a Honduran life almost 15 times less valuable than anyone else’s on the planet. Those facts alone sent us speeding out of the city in our rented four-wheel drive and toward the rural town where our daughter, Sara, teaches in a private bilingual school. Yet even at highway speed, we felt like we were passing from the proverbial frying pan and into the fire. Traffic accidents represent the second leading cause of violent death in Honduras. The humble school was a well-kept two-story, cinder-block affair sitting atop a bare cement floor, protected from tropical rains by only a corrugated tin roof. Walls were well decorated while the windows were simple cut-outs in the cinderblock walls with steel bars to keep out the unwanted. The lessons inspired perspective into the difficulty of learning English as a second language, a language with 42 pronouncable sounds. The use of the definite article makes English particularly tricky. But, trickiest of all is that most verbs have three forms. Still, the kids persevere because they know that English brings increased opportunity. 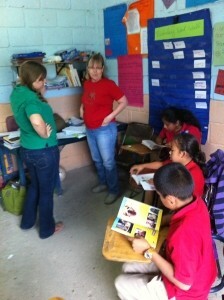 We ended our lesson just before lunch so that we could distribute some of the donated books to Sara’s class. We unzipped the suitcase and quickly witnessed a fresh perspective into the quenching power of books to a thirsty mind. After selecting small piles of books, the children returned to their desks where they read the books aloud to one another. Speaking in perfect English, this storeowners’ son described the joys of playing video games and riding a bike. But most of all he enjoys studying. “I want to go to Harvard or Yale,” he added with a naïve confidence. Finally, when I think of all we have as North Americans, I find the best perspective in a cryptic chapter of Luke’s gospel where Jesus reportedly says, “…to whom much is given, from him much will be required.” (12:48). If you’d like to help me get Jaime to school next year, write me at ask@thechaplain.net or P.O. Box 247, Elk Grove, CA 95759. Or leave a message at (843) 608-9715.